If you are learning German too, come join our group, Learning German Using Mnemonic Techniques. From my very limited knowledge of German, I think that the difficult aspects of the language will be the grammar and the exceptions. The first thing that I want to do is figure out how to organize my memory palaces. I need to know something about the grammar first. Wikipedia has a general overview, but I’m not sure yet how to deal with the exceptions that I’ve heard about. I’m thinking that I’ll use the memory town method for memorizing the gender of nouns. I’ll find three sections of the city for masculine, feminine, and neuter nouns, and then place images for the nouns in those sections. I will explain more about how I’m setting up my memory town as I make progress with the language. It appears that German uses prepositions differently. The example given in Wikipedia is that in English we would say, “the book is on the table and the poster is on the wall.” The word “on” doesn’t change. But in German, the word for “on” changes between auf and an depending on whether contact between the objects is horizontal or vertical. I’m guessing that there will be many situations like this to remember. Ich habe gegessen. — I have eaten. Ich bin gegangen. — I have gone. For Greek and Portuguese, I tried placing different verb conjugation groups in different parks within the town. Apparently German verbs have a lot of exceptions, so I’m not sure what I’m going to do about that. Where Modern Greek, Portuguese, and Spanish each have three main verb-conjugation groups, it appears that German has many more. I’ll have to explore some of the neighborhoods in Vienna to find locations for all of the verb groups. The German language has twelve different ways of forming the plural. A student of German as a foreign language must learn the plural for each new noun learned; although many feminine nouns are very regular in the formation of the plural, many masculine and neuter nouns are not. Will it be feasible to create separate locations for plural formats within the gender areas of my memory town? German adjectives normally go before the noun which they are changing. 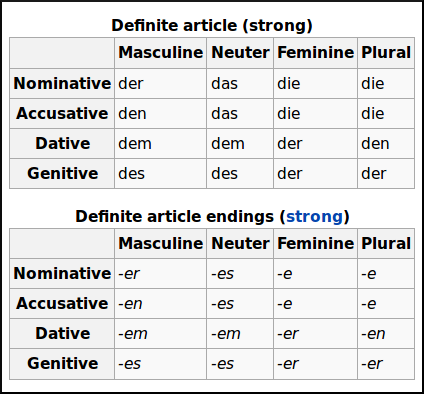 German adjectives have endings which depend on the case, number and (in the singular) gender of the nominal phrase, but there are in fact two sets of endings, called the strong endings and the weak endings. Which set is used depends on what kind of word the adjective comes after, and sometimes also on the gender and case. Based on how German-speakers use English, I think that there will be some grammatical false friends like these. When German-speakers say “homepage”, I’m finding that they mean “website”, and when they say “site”, they mean “webpage”. I’m still trying to figure some of these things out, and will keep an eye out for similar situations when trying to speak German. I expect to also be using Anki flash cards. I would like to put the 1,000 most common German words into an Anki deck and be sure that I know them as soon as possible. I did find an existing Anki deck with the 2,500 most common words, which I’ll use if I can’t find one that just has 1,000. I work in an office where everyone is constantly speaking in German, so I’ll be able to practice listening. The language is very difficult for me to pronounce (compared with languages like Portuguese, Esperanto, and Greek), and it seems that people have many different accents, but I’ll deal with that problem later. Also, I work for a company that runs five backpackers hostels with bars in Austria and Germany, so it may be a good environment for conversation practice, if the bar music isn’t too loud. After some experiments with studying Esperanto, which I will write about soon, and memorizing a bit of poetry in English, I thought that it might help to learn sentence construction by memorizing some foreign language poetry that is in strict meter. I won’t write about that idea now, but will save it for its own post. If you are learning German with memory techniques, come signup for our group! There are 58 members in the group so far. I’ll be in German classes for one month starting next week and things will be busy, but we could trade tips in the group and maybe even meet on webcam on Google+ Hangouts. "In the First Place, in the Second Place"
ich spreche nicht so gut Deutsch. Wel good luck anyway, keep up the good work. Ed cooke is a co-founder and it’s an awesome way to learn any language! with a competition flavour to it! lol, You’ve got yourself a new Mempal! oeh, about the memory town, what would you recommend? with the 3 different parts. do you put the images for the word football at a fooballfield? and pictures for the word car in a garage? or just random routes which you walk in order? The downside is that you need to be invited to use it at this point. I just got my invitation a few weeks ago and by combining Duolingo with memrise, I’m progressing nicely with my German. I’m also going to edit the post, since I found out it’s only 12 hours per week, not 15. I think I am going to put nouns for the three noun genders in three divisions of town. I might put a football in sports equipment stores or football fields… though I will be using some fields for verbs. Each section will need a place for sports equiptment. What if “football” is one gender, “goalie” is another, and “goalpost” is a third? That would require three locations in different parts of town. I love your method. I just came across your blog when I was looking for better ways to learn the use of the articles in German. I know of Matteo Ricci memory palace, but never tried to put it into practice. I’ve started studying German last year because I believe it’s a great tool to improve memory (I’m fluent in Portuguese and French and have a good working knowledge of Spanish and Italian. English is a second language.) I took a month of classes in Munich a year ago, and did separate the three ‘genders’ of the nouns I encountered in three different lists as per the articles, adding the plural for each of them. I also bought a series of CDs with children songs (a British friend of mine, Robert Metcalf, has been living in Berlin for the last 40 years and is a children entertainer there. He has a real talent for languages, and his CD’s are fun and helpful.) I even got some Biergarten and Lena CD’s although I wouldn’t recommend them for beginners.I also bought Quick Study 1000 words flash cards, and I keep adding more information to them; the internet is very useful for verb conjugation; I signed up for Duolingo; I bought the Pimsleur German course, which I really like, and have not yet used my new Rosetta Stone course. I also bought a series of books published by “dtv” – the left page is in German, and the right page is in English (it may be the opposite if they are translating German writers.) In my case, the writers are all Americans and their work was translated into German. I also got a poetry book by Alice Munro edited in the same way — I like Lufthansa flight magazines and try to get hold of them as much as I can (all their articles are also in German and English and it’s interesting to compare the two.) I’ll look for your other postings — very interesting. Thank you very much!